There are two sizes of Carlisle Outfitter Blade Assemblies to select from. 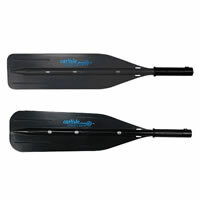 The 6.5" width is our most popular and a great no-frills blade for almost all rivers. The 8" width is useful when carrying a heavy load and pulling a lot of water is a must. These are the heavy-duty Carlisle Outfitter Blades and are much stronger than their standard blade. From David of Grayling , Michigan on 8/25/2016 . From Anonymous of Denver, Colorado on 2/25/2016 . From Anonymous of Renton, Washington on 3/16/2012 .